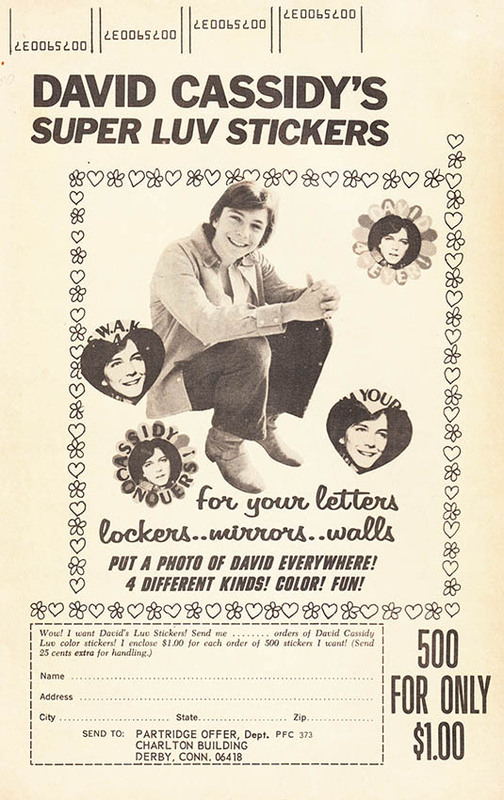 1970s kids everywhere recently mourned the death of performer David Cassidy, who shot to stardom as Keith Partridge, the hunky male lead of the family singing group The Cowsills. I mean, the Partridge Family. 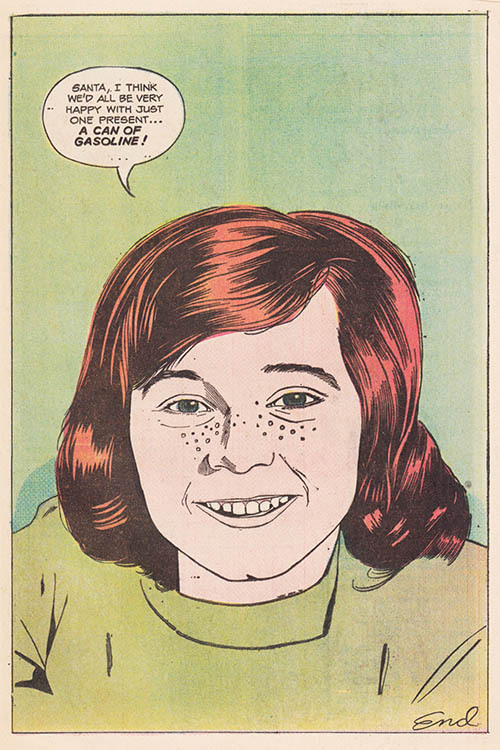 Cassidy parlayed his TV stardom into a musical career that spanned decades, brought his brother Shaun Cassidy fame as one of the Hardy Boys, and though his later life was punctuated by misfortune and struggles, the misfortunes and struggles of costar Danny Bonaduce made Cassidy's troubles pale in comparison. 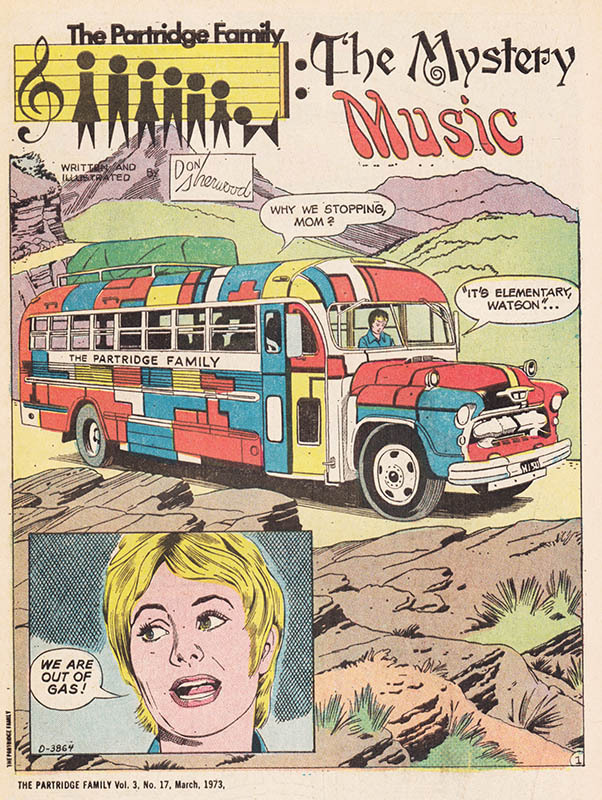 Anyway, as stars of the early age of cross-promotional multi-platform entertainment, the Partridge Family had their own poorly printed line of comic books brought to us by Charlton, the comic publisher best known for publishing the comics you bought when the drugstore spinner rack was out of everything else, including Baby Huey. Okay gang, let's put on our matching shirts and pose for publicity photos before we get out there and look for the source of the mystery music. Here's a hint - the mystery music is coming from the studio next door where a crew of professional musicians are performing the actual music you'll pretend to play on your TV show. 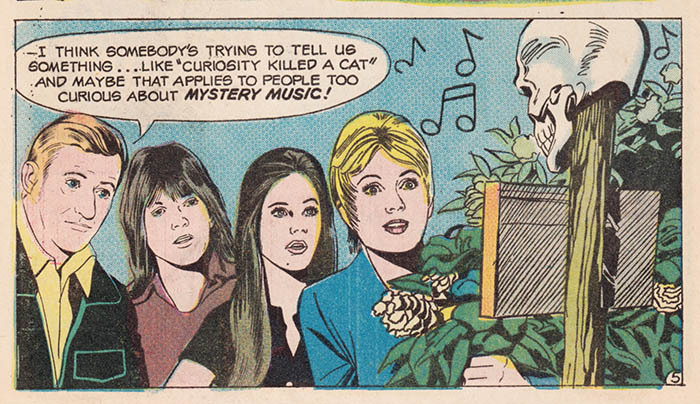 But that's not really a mystery, is it? Our story will begin in a minute. First, a word from our sponsor. FUN FACT: those mysterious numbers at the top of the page? Those represent how many freelancers Charlton failed to pay, as of March 1973. And now on with our story. They had a dream they'd go travelin' together, spread a little love and then they'd keep moving on. 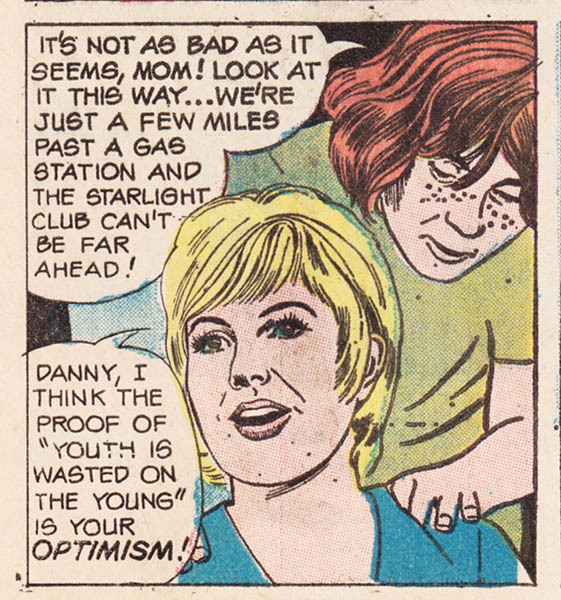 Well, when the '73 gas shortage hits, you won't be doing a lot of moving on, will you? 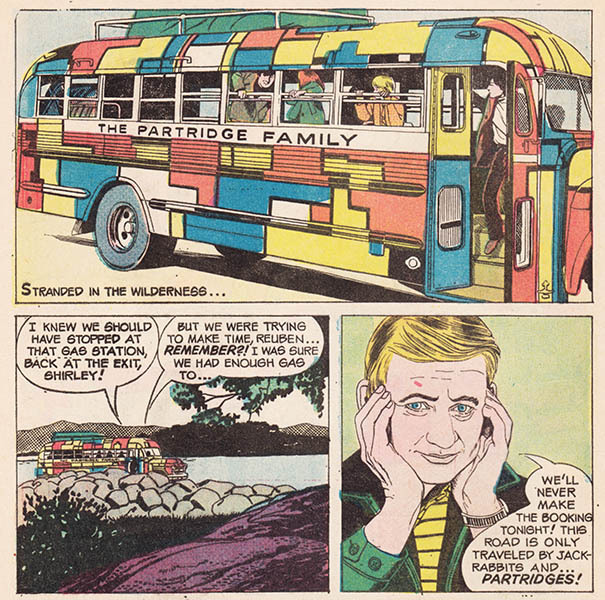 Stranded in the wilderness, the heavily photo-referenced Partridge Family Bus waits, content to sit quietly for the next fifteen or twenty years, until 70s kitsch nostalgia becomes a thing. Meanwhile, Reuben Kincaid has a headache. Well, maybe not here, but he did when the photograph this illustration was referenced from was taken. Sometimes, photo references were not available for the poses called for in the script, giving us panels like this, where Judy "Sock It To Me" Carne is menaced by what appears to be some kind of hunchbacked, malformed troll. 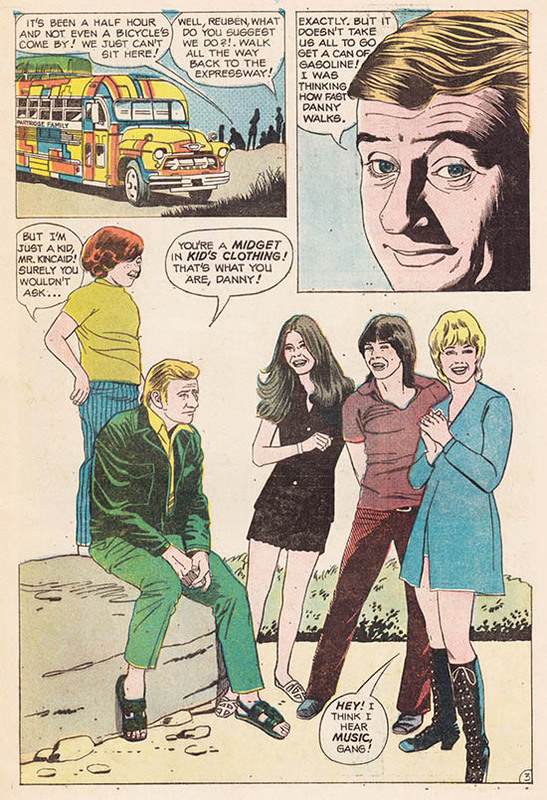 Also sometimes I gotta wonder at the business acumen of Reuben Kincaid, who seems to constantly book the Partridge Family for gigs in the middle of nowhere. On the other hand, let's be serious, they won't be selling out five straight nights at the Whiskey A Go Go any time soon. Out of gas in the middle of nowhere? Let's pose for a few publicity photos. Reuben can show off his sandals! Pretty groovy, Reuben. 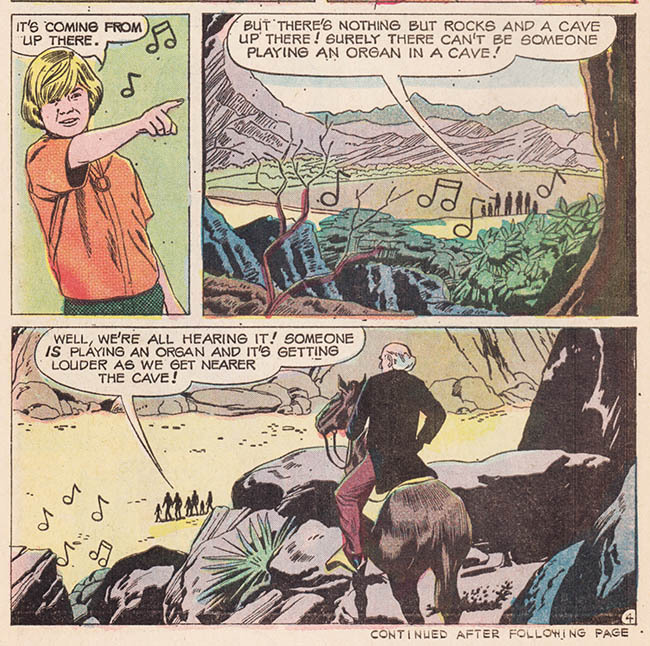 Well, we're at page four already in this story about mysterious music, I guess we'd better get mystery-solvin', and Chris Partridge Number Two leads the way across the burning desert hellscape! Sure, let Chris take point. Plenty more where that came from. Keith, what's the matter? You look like you're on stage singing "Echo Valley 2-6809" or "I Woke Up In Love This Morning" or "Rainmaker", one of the many hit songs on the Partridge Family's new LP "Sound Magazine," available now! 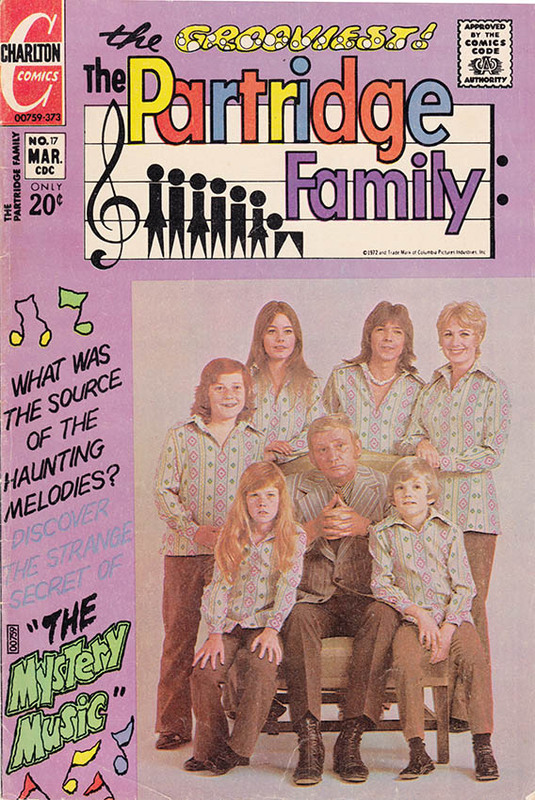 Any minute now the Partridge Family is going to stumble across the Brady Bunch, who research shows was lost in a ghost town in the desert at almost precisely this exact time. If it turns out Greg Brady and Keith Partridge are wearing the same pukka shell necklace, the universe itself will explode. So be prepared. Sure, I'll take my whole family, including two pre-teen children who really ought to be in school instead of pretending to play in a rock band, past this skull and this clearly worded STAY OUT sign, into this creepy desert cave full of God knows how many junkies, serial killers, and white slavers. Our mysterious horseman named his horse "Donner" - after the ill-fated Donner Party, no doubt! He's obviously some kind of kill-crazed desert rat exacting revenge on all who cross his path! Remember that time when the three youngest Partridge kids were all the same height? No? Me neither. 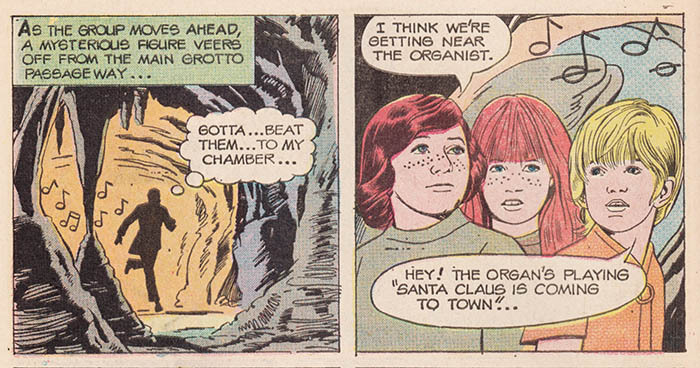 This sequence is a double gift - it's a present for anyone who ever wanted to see Susan Dey speaking excitedly about an "organ," and that second panel there, it's a wonderful teaching tool for budding cartoonists out there who might be wondering about the absolute laziest ways they can fill up panels and pad out stories. Hey gang, you haven't seen anything yet. 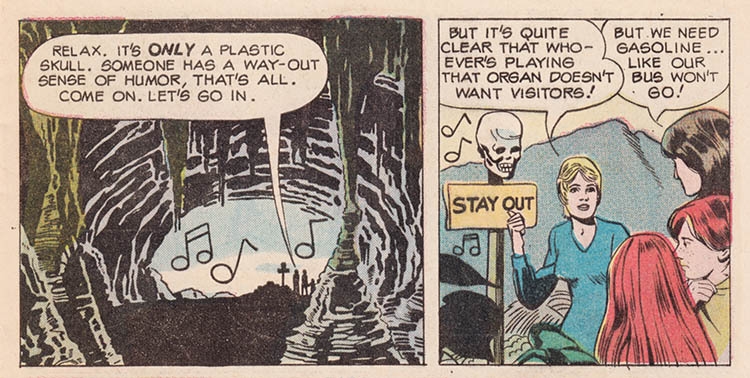 Maybe it's that pipe organ that characters are hearing the music from and are talking about but that we haven't actually seen in this comic book story yet because maybe the artist couldn't get photo reference, maybe. What DID the artist have photo reference for? SANTA CLAUS. 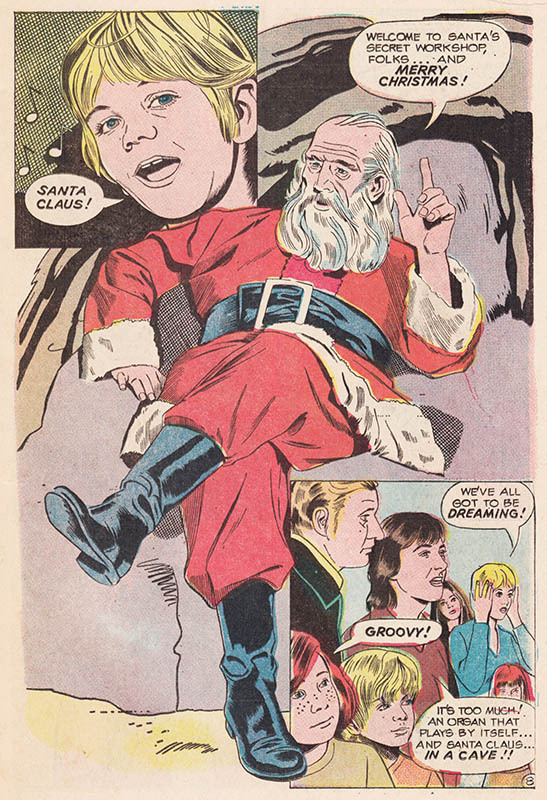 So here ya go, Santa Claus in a cave in the desert. Enjoy. So there's probably a really interesting story as to why this guy lives in a cave in the desert dressed as Santa, right? 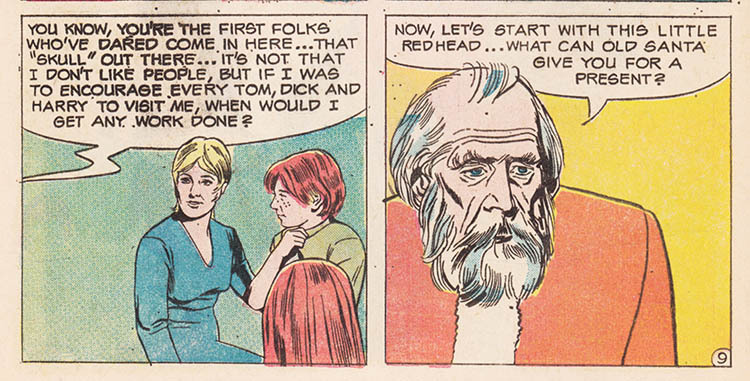 Well maybe there is but this comic doesn't give it to us. Instead we get a really awkwardly phrased description of a player piano, the shocking admission that Crazed Desert Hermit is not the actual real Santa Claus (!! ), and a dawning realization that this guy is dressed in a heavy wool suit walking around in 110F temperatures and is therefore even crazier than we had previously suspected. It's not that crazed desert hermit doesn't like people, he just lives in a dark cave miles from nowhere with a sign out front saying "stay out" with a skull on it. That's all. Now what do you want for Stay Out Skull Sign Sweaty Hermit Christmas, young man? 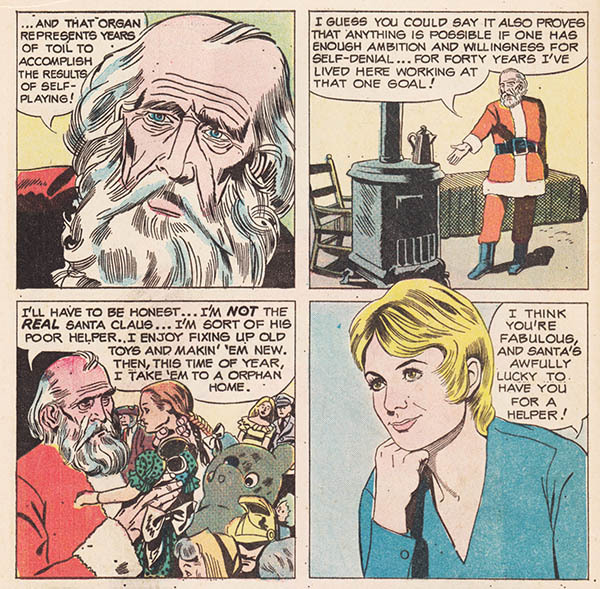 Hey, it looks like somebody got THEIR holidy wish, which was to fill up a whole page of the comic story with one traced drawing of Danny. The end. From the "Danny Partridge Is A Privacy-Invading Sneak" collection, it's Susan Dey's Private Journal! Can YOU make YOUR future dreams come true, exactly like Susan Dey? Well, since "L.A. Law" has been off the air for 15 years, you can't EXACTLY replicate Susan Dey's career. However, they'll probably remake "Looker" at some point, so stay sharp! Now I know what you're wondering. 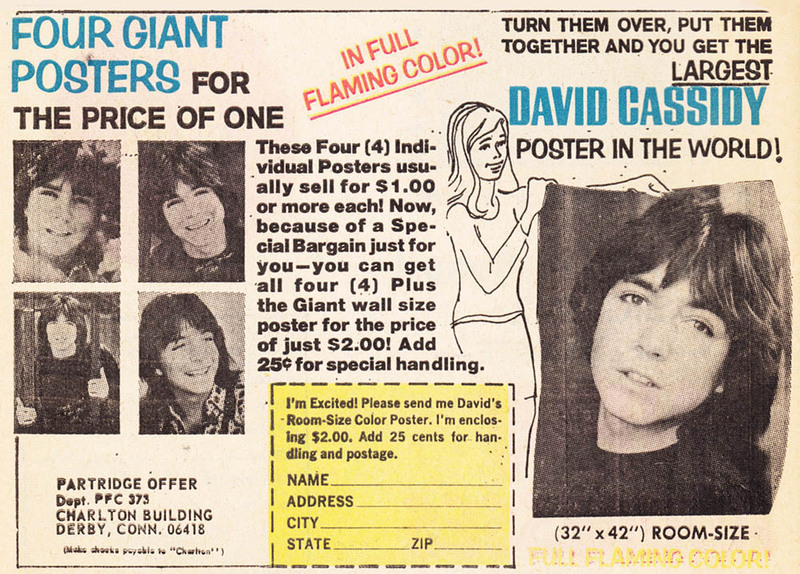 You're wondering if there was ever a way for you to own the largest David Cassidy poster in the world. Well, was there? 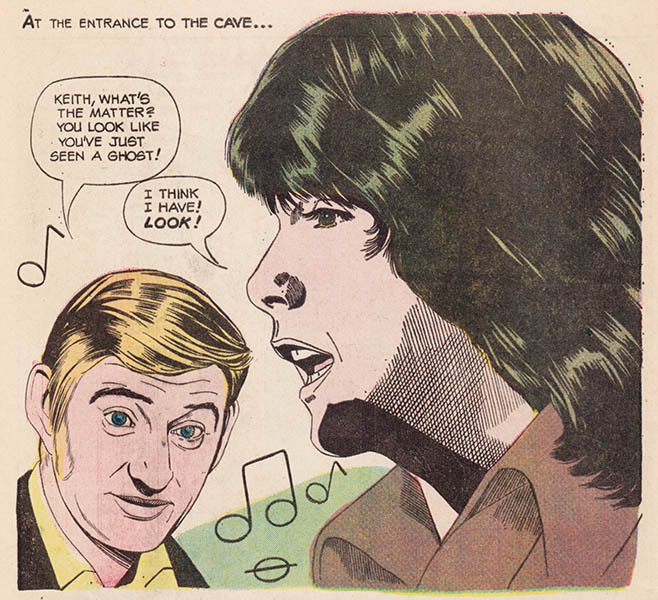 And with this we bid farewell to David Cassidy, star of "The Partridge Family", "Man Undercover", and, with Redd Kross, the little-seen time travel comedy "Spirit Of '76." May your fan club never run out of Luv Stickers and may your largest posters in the world forever be the largest.